Siobhan Horgan came late to cycling at 24 years of age. While recovering from a running injury she borrowed a bike from a friend and won a local novice race – against men! Her progression through the ranks was fast, and in 2005, after 1 year of cycling, she had secured a professional contract with the Belgian based team Lotto-Belisol. Siobhan was Ireland’s first female professional cyclist. 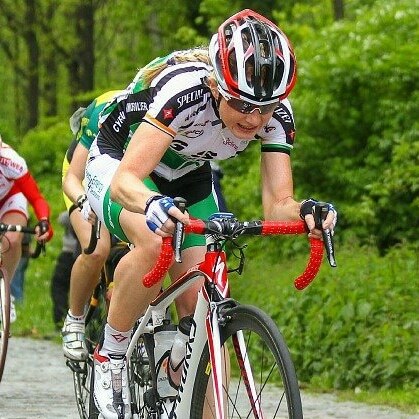 Siobhan competed for 7 years as a full time professional cyclist and faced many obstacles along the way. Due to breaking her elbow in a late crash in 2008, Siobhan could not finish the race which would have seen her qualify for the 2008 Olympic Games in Beijing. Siobhan did not allow this to dampen her enthusiasm however, and having recovered, she managed to finish 24th in the 2008 World Road Race championships, one of Ireland’s highest ever finishing positions. Over her 7 years as a professional, Siobhan has won 7 national titles – a feat no-one else has achieved in the senior ranks. Following her retirement in 2012, Siobhan returned to fulltime work as an engineer and decided to turn her hand to duathlon. She won 2 consecutive national titles (2013 & 2014) and competed in the 2014 european championships where she finished 12th. Immediately after this race however, Siobhan was diagnosed with a stress fracture which required at least 12 months of rest. This was very disappointing for Siobhan who was at the time targeting a top 5 finish in the 2015 World Duathlon Championships. However, rather than being discouraged, Siobhan used this as a motivator. She returned to cycling, but decided to focus on time trialling, a somewhat different discipline to what she would have done previously. As she was working full time, Siobhan became very adept at managing her time, which allowed her to train as a professional while working. She won the 2015 National Title by a significant margin, and competed in the World Time Trial Championships, where she finished 28th. The significance of this achievement cannot be underestimated, as all the other participants in the race were full time professionals . Siobhan has since retired from competing, but she keeps an interest in the sport by coaching others to success. Through her story Siobhan can discuss how we can use adversity as a motivator towards success. She understands the demands of modern life and can discuss how best to manage your time. She also understands the importance of teamwork, team motivation and focus and how we can all use this as a means towards personal growth and achieving our goals.